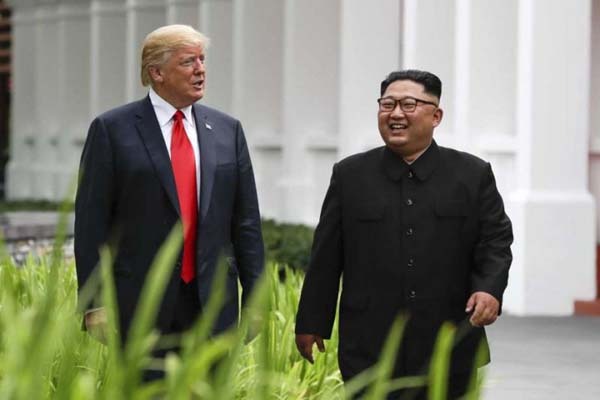 Singapore(PTI): US President Donald Trump today described his first-ever historic meeting with North Korean leader Kim Jong-un as “really fantastic” and said they have agreed to “sign” an unspecified document after their “very positive” summit, aimed at normalising ties and complete denuclearisation of the Korean peninsula. Trump and Kim met and shook hands at Capella Singapore hotel in Singapore’s Sentosa Island after months of diplomatic twists and turns. The two leaders had a one-on-one meeting, with translators only, followed by an expanded meeting including their top aides and a working lunch. “A lot of progress. Really, very positive, I think better than anybody could have expected, top of the line, really good,” Trump said after the lunch. “We’re going right now for a signing,” Trump said. It was not clear what the two leaders would sign but Trump said the public will find out soon. “I feel really great. It’s gonna be a great discussion and I think tremendous success. I think it’s gonna be really successful and I think we will have a terrific relationship, I have no doubt,” Trump responded when asked how he felt in the first minute. “We overcame all of them and we are here today,” he told reporters through a translator. Trump then said “Thank you very much”. Later, they emerged from their one-on-one meeting and headed into an expanded bilateral meeting. Trump said he believed he and Kim will “solve a big problem, a big dilemma” and that by working together, “we will get it taken care of”. “There will be challenges ahead but we will work with Trump. We overcame all kinds of skepticism and speculations about this summit and I believe that this is good for the peace,” Kim responded. On the agenda of the meeting is North Korea’s nuclear capabilities, which Trump is hoping to convince them to abandon in exchange for economic assistance. On the eve of the summit, the US offered “unique” security guarantees to North Korea in return for a “complete, verifiable and irreversible” denuclearisation. The summit at Sentosa – the first between a sitting US president and a North Korean leader – will mark a turnaround of relations between Trump, 71, and Kim, 34, after a long-running exchange of threats and insults. Trump said on Saturday that Kim has a “one-time shot” to make history. “I feel that Kim Jong-un wants to do something great for his people,” he had said.